Ali had his Frazier. Butch had Sundance. Team Victory has the Wolfpack. These two heavyweights know each other well and the respect runs deep both ways. 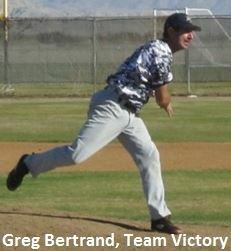 Team Victory kept pounding and pounding on their way to scoring in each of the first six innings of the 50-over National championship game in Las Vegas. That makes it tough to combat if you’re trying to catch up. As it turned out, the Boston Wolfpack spent the entire game chasing Team Victory and could never close the gap as Team Victory piled it on with an unexpected 11-1 lopsided victory over the tournament-seasoned Wolfpack. John Knoblauh, Frank Bons and Doug Thigpen all went 2 for 4 for Team Victory as they scored two in the first inning, one in the second, two in the third, two in the fourth, three more in the fifth and capped the scoring with one more run for good measure in the sixth inning. The Wolfpack finally got on the board with their lone run in the top of the ninth. Knoblauh and Thigpen scored twice as did John Love and John Murray. Dave Morrow was also the king of the hill by pitching complete games in the second and third games and only gaving up a total of four runs. The one-two punch at the top of the order, John Knoblauh and Bob Pone, stole a combined 11 bases to keep the pressure on the defense.